The substantial prosperity that characterizes market economies at the beginning of the twenty-first century is relatively recent in human history. Prior to the Industrial Revolution, economic progress was so slow that people would not have been able to recognize it in their lifetimes, whereas today, economic progress is so much a part of people’s lives that they take it for granted. In this new volume, Randall G. Holcombe argues that economic analysis, as it developed through the twentieth century, relies heavily on concepts of economic equilibrium, and is not descriptive of the dynamic real-world economy that is characterized by economic progress. Even in dynamic settings, economic models focus on income growth, leaving out the entrepreneurial forces that generate economic progress, resulting in the introduction of new goods and services and new production processes. Economic analysis focuses on the forces that lead to an economic equilibrium, not the forces that produce prosperity. This characterization of economic analysis describes a substantial component of economics as it has developed over the past century. However, there are also economists who have analyzed the factors that lead to an entrepreneurial and innovative economy, generating progress rather than equilibrium. This volume does not question the value of past research, but argues that, looking ahead, economics should build on its past to focus on factors that create an entrepreneurial and innovative economy that is characterized by progress and prosperity. This would make economic analysis more consistent with the remarkable progress and prosperity that characterizes the modern economy. 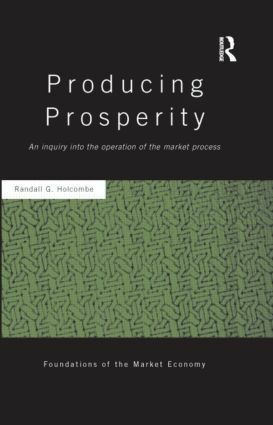 This volume lays out a framework for economic analysis that consistently incorporates the real-world factors that produce prosperity. Randall G. Holcombe is DeVoe Moore Professor of Economics at Florida State University, USA.